It seems impossible that one week ago I had just arrived in Venice by train and was bumping my trolley up and down the bridges between Santa Lucia station and the holiday apartment I had rented. It was located in a 17th century building in the Cannaregio district, the old ghetto, near the Ca d'Oro. At 8am, with no foot traffic and no bags to lug, it might have been a 10 minute stroll away. Now, though, stumping up and down those annoying bridges, it felt like an hour. Really! 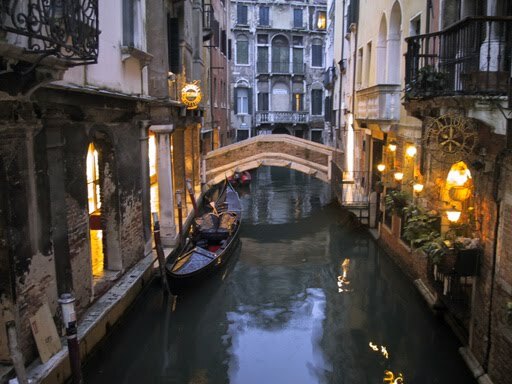 After having visited Venice in 1989 on a school trip, how could I have forgotten that all those picturesque bridges crossing canals every few hundred feet are built with about 10 steep steps up and down each side? Once I survived the wide commercial gauntlet of Strada Nuova, I found my alley easily enough -- Calle delle Vele, Street of the Sails -- and hauled my luggage over one final bridge to my apartment’s address. When I rang the bell Davide answered, the house caretaker whose family has lived there for hundreds of years. The entrance hall was heavy-beamed, dimly lit by two bronze sconces on the facing brick wall, and sparsely furnished in that beautiful old Italian way. A marble staircase leading my apartment curved up to the right. There was a heavy double wooden door opening directly onto the canal, where you'd get deliveries by boat, with stone steps inside the room leading down into dark, gently rocking blue water. The marble floor we stood on was about 18 inches above water level. I remembered studying that sirens signaling flood conditions, "Acqua Alta," "high water," sound when they predict the water will be around 39 inches high. To the right of the door was a collection of tools: a spindly wheelbarrow, planks leaning against the wall, buckets, tarps, cloths; to the left of the door was a workman with a hammer and chisel, slowly tap-tapping away at the brick wall; lying in a long pile above the steps down were lots of old bricks, presumably those already removed. Venice is one unending repair job -- as the buildings sink and shift, pipes crack, things give way, it all needs fixing. Staying in an apartment gives you the "real Venice" feeling you might not get in a 5 star hotel. My studio apartment, one floor above, was lovely, its 4 poster bed hung with translucent, creamy fabric that spilled gracefully from the ceiling and swaged about the top, the bathroom was large and thoroughly modern. Two big windows looked out over an unused, tangled garden of palms and trees and vines between the back walls of three houses, a quiet little rio forming the fourth side. Luscious pink and primrose yellow walls were catching light on our canal's far side. The apartment had a fantastic canal view from where you can watch elegant gondolas pass gracefully by. In an hour I sauntered out to enjoy the last light of the day. So... what can one say that is new about Venice? Well, for me, my perceptions of Venice were new and fabulous- every morning I was up and out around seven, my favorite hour for towns. The great blessing and curse of Venice is the absence of motorised vehicles other than boats, so it's quiet at that time except for the clanging of bells from towers, the clinking of saucers from espresso bars, the slopping of water against the rotting foundations lining canals. At first, just a few other people on the street, mostly heads down and hurrying and at this hour these are 90% men. There are tired old men methodically setting up newspaper kiosks where they'll sit hidden among a thousand periodicals and puzzle books and postcards all day, like hermit crabs; grumbly street sweepers; men in boats heaving boxes and bottles and bundles to other men standing on wet pavements or inside water-level doors; so many men rushing with big wheeled hand carts filled with supplies, through piazzas, down alleyways, bumping the bloody load up and down the steps of the bridges; a bit later, hordes of school kids hustling along with their backpacks full of books, like flocks of starlings flying at you out of tunnels; old people setting up grocery stands, arranging aubergines like works of art; then the handsome dark suits, leather briefcases bustling past, women in high heels streaking past to catch the vaporetto to the office. Breaking away from the sea of working people and tourists flocking at the city center in Piazza San Marco and heading for the narrowest alleyways is the greatest way to discover Venice! Don’t forget to bring a good map though. I especially love the old market area across the Rialto bridge: the massed vivid produce stands, the singing vendors, the smell of baking cornetti, the pastry shops and butcher shops. My favorite of all is the wet-floored Fish Market, where you see fish of every silvery slippery shape imaginable, alongside octopus splayed like exotic flowers, squids swamped in bins of their own ink, sea-creatures out of Bosch waving beaded antennae, eels still swimming in tubs, flatfish displayed in a dark-top/light-bottom pattern as if by Escher, big burgandy-blooded tuna torsos being sliced into steaks, things like marine pill-bugs on steroids still breathing and flopping as they're scooped into cartons and handed to customers at 8am. All smelling fresh as the see at high tide. Remember to never ever touch the product! This does not only apply in Rialto market, but in the whole of Italy. Ask the vendor of what you want and they’d be more than happy to give their best products to you. But of course Venice is gorgeous in so many ways! Perhaps above all, the crumbling stucco palette of it! Those yellows alone! Daffodil, primrose, lemon, straw; cream yellow, chrome yellow, cadmium, Naples, and Indian yellow! Oranges, ochres, mustards, umbers, siennas and rusts. Milk-white, cream-white, chalk-white, ivory, dove-greys, silvery greys. Persimmon and peaches, roses and mauves, salmons, geraniums, hot pinks, cool pinks, tints of magenta, black or dark green shutters for accent .... somebody stop me! Venice is definitely a work of art! Then there are the boats, so many shapes and colours floating by that alter the scene in seconds. Vivid blue motor boats, mud-dark barges, olive-drab dredges, strong red fireboats, big white crowded ferries, cardboard-brown carton boats, vermilion skiffs, black traghetti, shiny black gondolas with gaudy gold bow ornaments and scarlet interiors, bright white speedboats, yellow-striped vaporetti, parked boats covered with green tarps and blue tarps... and all the men sailing and most of the passengers too are standing, not sitting. More room for the load, I suppose. Taking a trip to Venice and failing to ride a Gondola is like going to France and ignoring the Eiffel tower. These traditional and symbolic boats have been used as transport around the narrow Venetian waterways for more than 10 centuries. Evolving and perfected through time, Gondolas are designed to be easily operated by a highly-skilled oarsman known as a Gondolier. Early in the morning you see so much more, without the crowds. Bronze moor-head door knockers. Grotesque marble carvings on lintels. The rat-poison notices on drainpipes. Aha! I wondered where they were, "Servizi Derattizzazione" say the fluorescent green signs, with a symbolic rat in circle/slash fashion. Venice must have been heaven for rats, and the Black Death took its toll in several waves. The plague of 1630 was a doozy. Venice still celebrates the end of that quarantine annually. 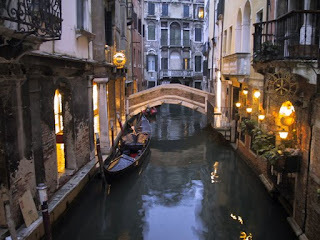 As I strolled around aimlessly I was impressed by how fast the Venetians walk! It must have to do with the Byzantine maze of Venice's streets and canals, which makes it devilishly hard to get anywhere. One early morning I blithely set out for a major piazza across the Rialto bridge, the Campo San Polo. Ask your tour guide or anyone who knows the city about the eeriest place in Venice, and I’m sure they will point you to Ca’Dario, a Palazzo with an attractive Venetian Renaissance architecture along the Grand Canal. The series of unexplainable deaths which seem to affect all of its owners first started way back when the structure was built in 1847. One morning I went down to the Fondamenta Nuove, a long cement walkway facing the cemetery island of San Michele. In the choppy broad canal every sort of boat sailed and wallowed and sped every which way. There were ferry landings here for the islands -- Murano, Burano, Torcello, and San Michele (you could buy a one-way ticket to the cemetery for just 2 euros), some unadorned bars, some inexpensive caffes and pizzerie. In the window of one pizzeria was a poster for "Street Grapple System Extreme Ratio" training, featuring a scar-faced master of battle staring you down through the curves of a jaggedy combat knife held in his hairy, ham-like fist. At the top was written "When the search for your own style becomes an art." Elsewhere, I saw someone offering "street-fighting" lessons for bambini 7 and older. Shopping? Did I hear someone (who must not know me well) ask about shopping? True, I have my guilty weakness. There were the usual hideous Italian fashions, some fabulous high-heeled boots, phantasmagorical purse collections, pretty Murano glass displays. But mostly what I perused were carnival masks -- especially cat masks. Venice has shops crammed with masks. Gilded, feathered, leathered, pearled and lacquered masks; filigreed, rhinestoned, ribboned and embossed masks ... I don't remember there being so many mask shops before. Sad masks, happy masks, funny ones, angry ones; devils and angels, 2 faced, 3-faced, beauties and beasts; sun masks, moon masks, elegant ladies, jesters and moors, pirates, Medusas, Venus and Death, every species of animal masks. OK, I even bought a blank cat mask to paint myself. But the classics are spooky long-nosed types, and the big one that caught my eye was labeled "worn by doctors during the plague." After 10 minutes in an Alladin's cave of a mask shop we'd reel out spinning from visual overload. See, again! All this carnevale stuff is a bit creepy, rather than festive. This is a sinking, shrinking city, after all, that's lost half its population in the past 30 years. It's a culture on life-support, don't pull the tourist plug! Venice, a hundred islands linked by bridges, has been flooding since the 5th century. Now they're trying to hold back the tide -- though Acqua Alta is a phenomenon of wind and barometric pressure, not a tide at all-- through a grand engineering project rightly called "Moses." Wish them luck. I thank Rick Steves for the statistics. What else? I barely skimmed the surface, Venice is overwhelming! Go while you can!